Facebook is overhauling its in-app camera to embrace the next era of augmented reality visual communication pioneered by Snapchat. The new features include Snapchat-style animated selfie masks, overlaid graphics, and geofilters; Prisma-esque fine art-themed style transfer filters; and some innovative new “reactive” filters that respond to your body’s movements. 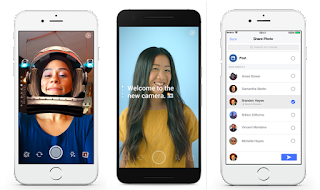 What Facebook is calling “the new camera” will be instantly accessible from the News Feed with a quick right swipe. And instead of just News Feed broadcasting, you’ll be able to privately share the photos and videos you make in one-on-one threads through the new ephemeral Facebook Direct inbox.